Kevin Durant scored a game-high 32 points and Steph Curry added 25 as the reigning champion Golden State Warriors come into Washington and beat the Wizards, 109-101 on Wednesday night. Otto Porter led the way for Washington with 29 points, including 18 in the first half. Kelly Oubre added 17 points for a tired, dead-legged, Wizards squad playing on the second half of a back-to-back but it wasn’t enough to avoid the inevitable in this one. The Wizards looked off to start the game. Shots weren’t falling in the first quarter and guys were making lazy passes leading to easy transition opportunities for Golden State. Washington committed five turnovers in the first quarter which turned into 11 Golden State points as the Wizards found themselves in an early hole. Washington refused to let it get out of hand. They made several runs to keep the game close, but unfortunately for the Wizards, the Warriors did that thing where they let teams hang around and make them think there’s a chance to take control, only to rip off an 8-0 run in the blink of an eye whenever things got too close for comfort. Everything changed for the Wizards in the second quarter thanks to the reserves. The bench unit ripped off a 10-0 run with hustle plays and ball movement to get the Wizards back in the game before it got out of hand. There was a sequence in the second quarter where Tim Frazier nabbed two offensive rebounds on the same possessions and dished the ball off to Mike Scott for a thunderous jam. Tim Frazier is the smallest guy on the court, yet he got two offensive rebounds on the same play to set up a huge slam by Mike Scott. That jolt of energy the reserves provided carried over when the starters returned to the game as Porter, Morris, and Satoransky all knocked down 3-pointers as Washington was able to regain the lead for a brief moment, 53-52. Washington outscored the Warriors 35-22 in the period giving them a fighter’s chance entering the second half. Not bad, considering Bradley Beal didn’t score until the third quarter of the game. Not only is Washington in the midst of their toughest stretch of the season, but having to play Golden State on the second half of a back-to-back after playing in Milwaukee the night before? Brutal. As a result, the Wizards came out flat to start the game and looked stuck in the mud for a large portion of the second half as they tried to fight back. Don’t read too much into this loss. The Wizards just need to move on as they have two more important games against Eastern Conference foes later this week. Everyone snacks – The Wizards combined for 25 assists tonight. Still good, but not 30+ assists like we’ve become so accustomed to in recent weeks. Washington let the long ball fly tonight jacking up 32 three-pointers, but they only connected on 11 of them (34 percent). Up Next: Hell week continues as the Raptors come to town Friday night in a pivotal Eastern Conference matchup. The Wizards had a chance to knock off Golden State but their 18-point lead evaporated quickly in the fourth quarter as the Warriors would win 120-117. Washington was up 80-62 in the third quarter but Golden State would outscore Washington 33-20 in the final period to regain control. This one got chippy as Bradley Beal and Draymond Green were both ejected in the second quarter after a scuffle that was building up over time. Washington falls to 1-2 on this early season west coast road trip. This started early and kept on building as the refs let them play. John Wall got whistled for an offensive foul in the first quarter in which he felt Steph Curry flopped. The two would have some choice words for each other but nothing would escalate between the two. Late in the first quarter, Bradley Beal drove baseline and Draymond Green looked to jump straight up for the block but there was a lot of contact and no foul called. Green, who has a reputation for running his mouth, proceeded to run his mouth as the two jogged back up the court. Things were starting to heat up and finally, a Green block on Beal was the tipping point. Beal drove only to get rejected by Green at the rim who made sure to let Beal know about it afterward. Beal retaliated with a shove to Green’s back and that’s when all hell broke loose. FIGHT BETWEEN THE WIZARDS AND WARRIORS. Expect a couple of fines and suspensions to come of this. Washington has struggled all season shooting the three-ball but finally got hot from distance tonight. The Wizards shot 33 threes, a season-high, connecting on 15 of them, also a season high. Otto Porter Jr. knocked down a career-best seven three-pointers including two clutch ones in the fourth quarter to keep Washington in the game as Golden State was looking to run away. Kelly Oubre was terrific from three-point range connecting on his first four attempts and at a time when the Wizards were building out their 18-point lead. Oubre would miss his final two attempts but still ended the night 4-6 from distance. Looks like all that work with the shot doctor is starting to pay off. Otto Porter just keeps getting better and better and so does his offseason signing. Porter led the way for Washington tonight with 29 points on 11-16 shooting including 7-9 from three-point range. Porter grabbed 10 rebounds and also played terrific defense on Draymond Green in his new power forward role. If Porter can continue to have impressive nights like this, the Wizards might not need to grab a free agent to create their own ‘Big 3’. 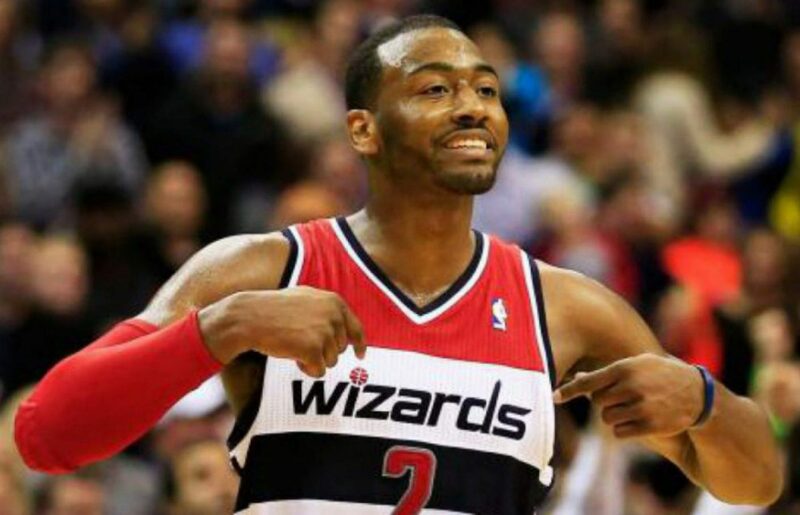 To no one’s surprise, John Wall was great dishing the ball out as he notched 14 assists. However, his shooting continues to struggle. Again, Wall got off to a slow shooting start tonight and looked to force the issue a few too many times. Wall was driving to the hole to get calls, not to score, and unfortunately for Wall; he wasn’t getting those calls tonight. Kelly Oubre Jr. matched his career-high with 19 points. The third-year player was terrific connecting on his first four three-point attempts in addition to snagging eight rebounds. Oubre looks better and better as this young season rolls along. Free throw shooting may have cost Washington the game. The Wizards were just 16-22 from the line which isn’t terrible however four of those misses came in the fourth quarter while Golden State was mounting their comeback. The Wizards missed six free throws and lost by three points. You do the math. Next up: Washington heads to Sacramento on Sunday night to close out their road trip. The Golden State Warriors beat the Cleveland Cavaliers for the second time in three years on June 12th. And ever since that day, every team not named the Warriors is scrambling to try and play catch up. The blueprint is out on how to win a championship. Just years ago, a “Big 3” would be enough to get the job done. But as we just recently saw, having three all-stars including LeBron James, was barely enough to keep the Cavaliers from getting swept which would have been the ultimate embarrassment. A “Big 4” is now required to compete for a championship. And as a result, teams are in full-on scramble mode in trying to orchestrate a team that will give them a fighting chance against the Golden State Warriors over the next few years. The Cleveland Cavaliers have made three-straight finals appearances and won one of them. However, in the owner, Dan Gilbert’s mind, that plus “disagreement on the direction of the future” led to the termination of General Manager, David Griffin. Let’s think about that. A General Manager who made the finals three straight times and under extreme circumstances (having to consult LeBron James on every decision) still wasn’t enough to warrant an extension. Now that Cleveland is aware that a “Big 3” of LeBron James, Kevin Love, and Kyrie Irving isn’t enough to compete with the Warriors, they’ve started reaching out to the Pacers and Bulls to gauge the interest of Paul George and Jimmy Butler respectively. Griffin was elbow deep today, as late as an hour ago, working to put together a monster deal to get Jimmy Butler from Chicago. Even with Cleveland’s success, the Cavaliers are still left scrambling as they were trying to acquire star Jimmy Butler from Chicago. After it felt like Kevin Love had found his niche with the Cavs, he’ll now be the centerpiece in all trade talks that the Cavs are involved with. And remember the Lakers? The lowly Lakers who finished 26-56 this past season? Well, they’re just as much in the mix as Cleveland is. Just last night, The Lakers traded D’Angelo Russell and Timofey Mozgov (salary dump) to the Nets in exchange for Brooke Lopez and their first round draft pick. This is significant because with the Lakers expected to draft Lonzo Ball on Thursday night’s draft, they’ve now cleared up roughly $60 million in salary cap space which will allow them to sign one and potentially two max deal free agents in the summer of 2018. Now that Paul George has made it clear that he’s leaving the Pacers after next year to go to the Lakers, teams are in a bind debating whether they should take a shot on the all-star for one year knowing that he’ll leave or just stay away altogether. About a half a dozen teams are interested in George but realistically, he’s going to be in either a Pacers, Cavaliers, or Lakers uniform next year. And remember that Lebron James guy? He can also opt out of his deal in the summer of 2018 and has been linked to the Lakers on several occasions. Now the Lakers have the cap space necessary to sign both James and George next summer including other aging stars if they are willing to take pay cuts to form yet another super-team. To recap: A GM who won a title just one year ago has been fired. The best player in the league is unsettled with the firing of his GM and now looks more likely than ever to leave for L.A. after next year. A perennial all-star has demanded out of his current situation. The Lakers have cleared an enormous amount of cap space to make a run at one, maybe two more free agents. And the NBA season ended just nine days ago. Not to mention, the Celtics could potential land Blake Griffin or Gordon Hayward. The Clippers are now shopping De’Andre Jordan. And the Knicks (yes the Knicks!!!) have started shopping Kristaps Porzingis to gauge the interest level of other teams. And why all the chaos? Because how the hell else are you going to beat the Golden State Warriors? Wizards at Warriors final score: Curry scores 42 as Warriors blow out Wizards, 139-115. Steph Curry catches fire for 42 points as the Warriors beat the Wizards 139-115. Bradley Beal scored a team-high 20 points while Wall chipped in with 15 points and 11 assists but the Wizards didn’t have enough firepower to hang with Golden State tonight. The loss drops the Wizards to 2-3 on this road trip and the team is now a game back of Toronto and are currently in the 4-seed. Steph Curry was smoking hot from the get-go and there was nothing the Wizards could do about it. Curry knocked down his first three three-pointers just minutes into the game as the Wizards found themselves in an early hole. But after a 0-3 start from the field for Washington, the Wizards connected on their next 7-8 shots to tie the game. Bradley Beal scored 13 points in the period while Wall dished out six assists but the Warriors shot 58 percent for the quarter for a 35-30 lead. Former Wizard, Shaun Livingston also started out hot from the field as he connected on his first five field goals, all in the second quarter. Washington made several runs to cut the lead down to three, but the Warriors always had an answer. Washington used a 10-2 run to cut the lead down to two, 53-51 but the Warriors used a 12-4 run to close the half and led 67-57. The Splash Brothers remained hot in the third quarter. Klay Thompson started the period off with a deep three to stretch the Warriors lead while Steph Curry was hitting acrobatic shots like this one as the Wizards founds themselves down by as many as 20. Golden State led 106-88 and once again, things looked bleak for Washington. The Wizards started the fourth quarter on an 8-0 run sparked by the reserves. Washington was able to get the deficit to as close as 9, 116-107 midway through the fourth quarter. But the Warriors reserves would hang on to win this one 139-115. Yes, Golden State is a different animal, but once again the Wizards didn’t do much to deter the Warriors tonight. Golden State shot 56 percent from the field and knocked down 16 three-pointers as they surrendered 100+ points through three quarters for the second time in three games. And as expected, Steph Curry had his revenge game against the Wizards with 42 points. After his best four-game stretch of the season, Kelly Oubre came back to earth on the offensive end. Oubre scored just six points tonight on 2-11 shooting including just 2-4 from the free-throw line. On a positive note, Oubre stayed in stride on the defensive end with several deflections and hustle plays. The offensive isn’t always going to be there for Oubre, but the key for him is continuing to play hard on the defensive end. The Wizards committed 15 turnovers resulting in 28 points for the Warriors. You’re not going to beat Golden State coughing up the ball that much.